I thought it worth revisiting Velocity’s excellent and very useful ‘Family Pooling’ feature given how much benefit it can offer to couples and families trying to build their points and status balances. Family Pooling is unique to Virgin Australia and is designed to get your whole family loyal to the airline, by allowing frequent flyers in the same household to link accounts to collect and combine points and status credits between family members. The head of household manages the points and earns the full status credits of the family group, allowing them to earn Velocity status much faster. There are also ‘Family Transfers’, which allow on-demand transfers of Velocity points only between Velocity accounts. It’s not complex to set up in either case, and this guide runs through how to do both and some of the example uses and benefits. Family pooling is set up with a beneficiary (the person who will receiving points and status) and contributors (those who will be adding their points and status), with the beneficiary most often being the one who does the most travelling. Using Family Pooling means that every time family members earn points and status credits, they will automatically pooled into the indicated account. All points earned into all household member’s Velocity accounts are pooled automatically on an ongoing basis – including those from credit card signup bonuses. This member earned 1,120 status credits, more than enough to reach Velocity Platinum. 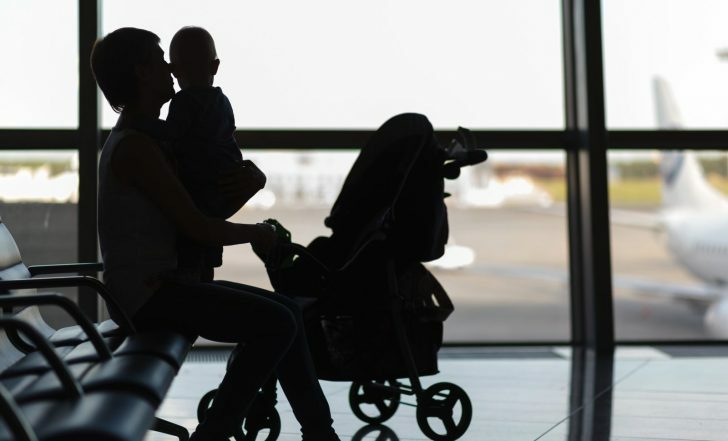 Admittedly it’s an extreme example as not everyone travels in paid Business Class with their family, but the benefits are multiplied significantly by using Family Pooling. To get Family Pooling set up first you must indicate who will be the beneficiary of the pool, and appoint the contributor accounts of each family member, by selecting ‘Set up Family Pooling’ from the left hand navigation of the Velocity website once logged in. 4 children under 18 years of age. When a child turns 18 they will be automatically removed and you may add / swap for another member. Once the pool has been set up and a beneficiary receives points from contributors, points pooling cannot then be reversed. 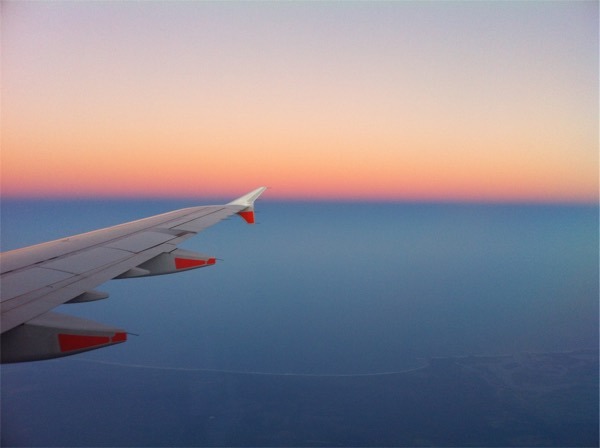 Essentially, Velocity are rewarding households for shifting their full loyalty to Virgin Australia and Velocity, including points earned from all sources. The upside to Family Pooling is that status credits from everyone’s travel across the pool are combined to the beneficiary’s account, meaning they earn status much faster – and can potentially then guest other family pool members into lounges and share other status benefits if travelling together. Updates to the pool setup can be made at any time, so you can reorganize who the beneficiary or the contributors are if looking to improve another member’s status once you’ve hit your own status target. This is an easy way to fast track a family member to that next level, so that they can enjoy some of the perks that come along with achieving Silver, Gold or Platinum. 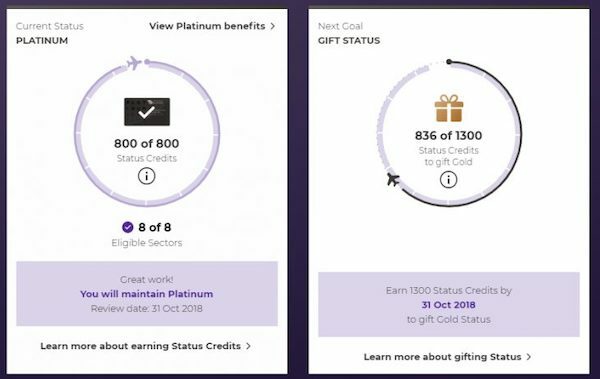 Remember that if your family member is close to a status upgrade you may want to wait to set up pooling, as their points/credits will automatically be given to you and they would not be able to achieve the next level. Velocity family transfers are a little different, and don’t require you to link your Velocity accounts on an ongoing basis to merge your balances. You can make up to four transfers per year which are free when done online. There’s a minimum transfer of 5,000 points, and a maximum of 100,000 points. The transfer is initiated from the left hand navigation of the Velocity website once you are logged in, from the account of the member who is transferring the points out. You are required to input the recipient’s details and confirm they are an eligible family member, before making the transfer. Should you use Family Transfers or Family Pooling? All members must reside at the same home address and proof of this may be requested if Velocity suspects any wrong-doing. Family pooling is much simpler to deal with ongoing, requiring no admin to keep on top of, and is ideal for families where there is a primary travelling family member with the other family members not having a chance of hitting Velocity status – and where everyone is living at the same address. The downside is the more fixed nature of the status and points balances, which cannot be redistributed once pooled. If that’s not a concern, go for family pooling. The upside of family transfers is the additional flexibility for points balance management, but with minimum and maximum transfer amounts (and frequency of 4x per year) to be able to combine points. Family transfers though will allow you to combine a wider range of family member’s balances, including those not at the same address. In either system, the terms around eligible family members need to be acknowledged – while there are no hard checks on family members other than the address requirement for pooling, you’ll need to decide how comfortable you are skirting these rules if you decide to combine balances from further afield. I’d recommend against it. Remembering that family pooling and transfers exist is a key part of managing and growing your Velocity points balance to a usable amount. I have around 140 and my wife has 470. If we pool right now, do my 140 Status credits go to her now or is it only credits I earn from flights from now on (not the past 140 credits)? Hi my partner and I both recently went Gold on Velocity in March. We both have 660 status credits, most of which was from a recent RTW business deal. I’m fairly new to this status. We are unlikely to be able to retain gold individually with our future travel plans, however I’m flying to the UK shortly with Singapore which will give me some extra status credits. Whats the best way for at least 1 of us to retain gold for a further year (or one of us to hit platinum). Hello – any tips or advice appreciated. I have two mobiles with Virgin Aus and paying $64 / month total. 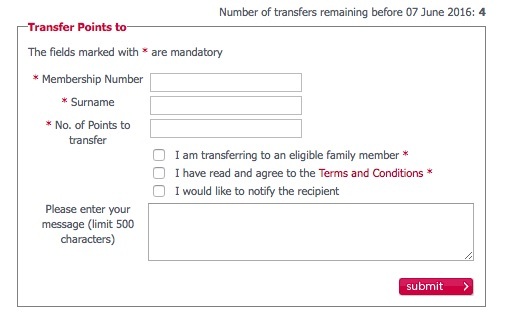 How can I get around the 5000 minimum limit to transfer my daughter’s 1510 points to me? Can I transfer 3490 to her and then 5000 back from her to me? for the family pooling, I have parents, in laws and wife all frequently flying with VA. Since the limitation of 2 adults, can I add one of them in the family pooling before they fly and change to another once the status credits and points been “pooling” into my account? Sounds like your plan is possible. How nice it would be if QF did the same thing. I will be paying & traveling overseas with my granddaughter but I do not live at same address. Can I still organise to have status credits & ff points added to my gold velocity membership? It seems that separate address is the yardstick to determine family pooling. That’s correct, family pooling does require all members to have the same address set in their Velocity account. That means Family Transfer is what I will need to do or in fact my son will need to transfer points to me. Family Transfer is Points only or Points AND Status credits as well? Family transfer is points only, family pooling is points AND status credits (which is the criteria for allowing it is tighter). I have family pooling set up with a family member – but only points not status credits. Now I have 50 status credits which I would like to transfer to that person as well but I can’t see how to do this. How could I change this to pool both status credits and points? Thanks so much Keith. That helps. My husband and I often travel without each other so I don’t think family pooling is for us. I think that transferring points if necessary would work better for us. Firstly, if you have family pooling and a contributor wants to travel alone without the beneficiary, what status credits do they have? The same as the beneficiary or none, or something in between? Secondly, can we pool points and status credits from the past or does the pooling start from when you join the program? Ive set up family pooling a while ago and now want to add another family member but there isn’t any button or tab that allows this. Can you please assist. 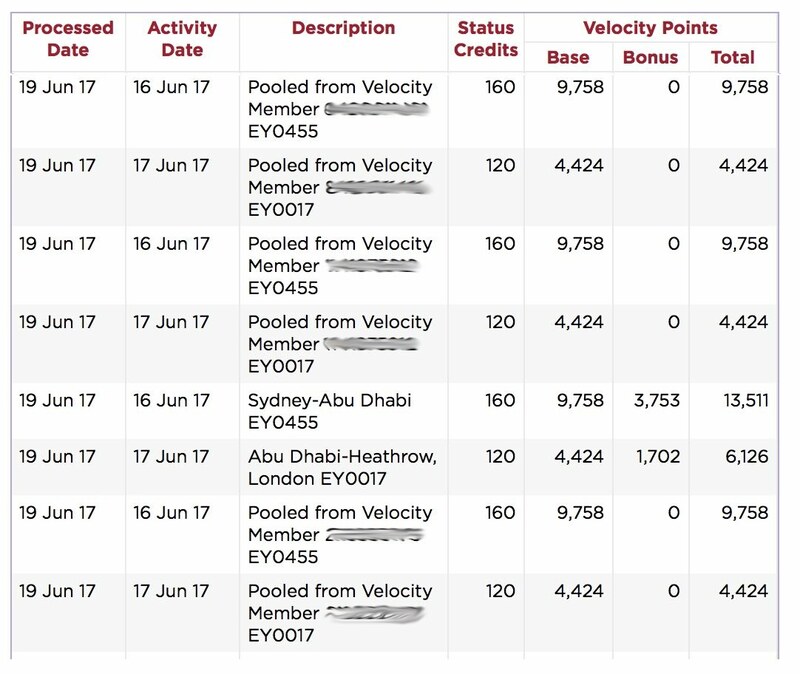 I have a 3 and 5 year old and flying in a week – do i actually have to setup velocity accounts for each of them to link family pooling? Yes, an account for each family member is needed. Hi Keith, do you know if the qualifier of four sectors for gold is just for the eligible member? Ie if I fly with my partner on two sectors and we are family pooling is this classed as four sectors for me or only two? Just wondering if it is worth us having two silvers or just one gold. One Gold would be better than two Silvers if you frequently fly together. But in answer to your question… I don’t know! Can you put that one up over in pointhacks.com.au/questions and hopefully someone else might have experience with this? Unfortunatly no. The sectors can’t be pooled. One Gold is better and can bring a guest into the Lounge, and use priority check in for you both. Hi! Can you tell me when the family pooling is effective as in the time. If I change the beneficiary from myself to my husband is it from midnight onwards? I am 15 SP off Platinum but my husband and I are about to return on a premium econ flight which would give me lots of SP but a bit of a waste as we won’t get enough to bump him to complimentary gold in the next 12 months. I would prefer him to get to Silver if we change the pooling recipient to him. The outbound flight from US on the 19th, connecting flight on 21st (dateline included) 4 hours between flights. I would like the points from the US to go just to him and then afterwards ie, 21st connecting, to go to each earner (him and I). If I make him as the receiver prior to the 19th. Then change to separate earning either on the 19th just before getting on the flight (if it is effective from midnight onwards) would this plan succeed? Do you recommend an optimal time to switch? I’m not sure, and don’t want to give you any misinformation on this. Given you’re not trying to do anything outside of the terms of family pooling I’d suggest giving Velocity a call and asking them directly to see if they can help. I have had little interest in accruing status credits as most of our flights are with various carries as we just take the cheapest deal we can find. We fly to China a few times per year though and with the planned codeshare of Virgin Aus and Hainan Airlines I am anticipating being able to use their codeshare regularly and may be able to obtain some FF status if I pool with my wife. So once I stop pooling with my SIL I can then bring over my wifes points and status credits (once we have more) and then just transfer points from my SIL (who will probably not have any/many status credits) when ever we want. Is that the best way? 13.5 A maximum of five (5) new Contributing Accounts may be linked to a Beneficiary Account in any Calendar Year. 13.6 A Contributing Account may be linked to a maximum of two (2) new Beneficiary Accounts in any Calendar Year. I have family pooling setup with my son in law. We share the same address. My wife also has a smaller points balance and some status credits. I cannot family pool with her because of the 2 x over 18 only rule. Am I able to move her points and status credits to my account with a family transfer or does the same rule prohibit it. Family transfers can only move points, not status credits unfortunately. So need to pick the right pooling member who is most likely to earn more status credits to pool with. I’m a current Velocity Gold member. Thanks to being the beneficiary of my partner’s pooled status points, I’ve requalified for another year of Gold six months in advance. However, given that a fair chunk of my rolling status credits are due to expire next month (and my foreseeable travel schedule does not include much long-haul or business), I’m unlikely to hit Platinum. Given this, would you advise redirecting pooling to my partner, who is a Red? Am I correct in presuming I wouldn’t need to collect status again until my next 12mths of Gold commences, in 6mths’ time? Velocity status is earned annually according to a membership year start/end date, it’s not based on a rolling year. So you’ve got 6 months to earn more to try and hit Platinum before those in the current year expire. That is if I understand you saying you qualified for Gold six months in advance correctly. I am living with my partner in which we have a child but not married. Will we be eligible for family pooling? You just described my situation, and yes from experience you are fine to family pool. Velocity care about the same address primarily. Hey Gianni – yes, the head of household (points / status holder) invites other members to join their household, which they have to approve. It’s not too fiddly once you’re logged in and start the process off.